Focusing on maximum client satisfaction, we are engaged in offering a quality range of Dispensing Booth. 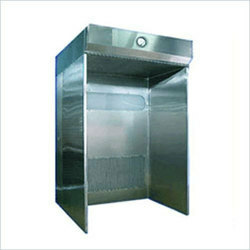 The offered booth is widely used for dispensing the powder and minimizes the risk of contaminating the work zone. Its usage ensures health safety of a person working with chemicals. This booth can be customised to meet the requirements of the clients. In order to maintain their premium quality and flawlessness, a team of quality controllers strictly check these booths against predefined quality parameters.